We all understand the hassle of finding the perfect ladies top for a specific occasion. Every single woman must have faced this scenario. With different styles being launched every second, we are definitely not short of choices. But how do you know which top to wear when? Ladies tops are always in high demand. And we all know why. We need to stay in trend, we need to stay stylish, and we also need to stay comfortable. This is one reason; different brands have introduced different types of stylish tops for women. We have picked few of the best types of ladies tops that can surely enhance your overall appearance. Knowing when to wear them may help you create an impressive impact. T-Shirts: If you love casual look, T-Shirts are best for you. Pair them up with your denim or shorts and bring out the sporty side in you. T-Shirts are comfortable and can be worn in any season. If you are planning for some outdoor activity with your girlfriends, you may slide into one of the solid coloured T-Shirt and make the most of the day. Easy to wear and easy to wash, T-Shirts for women are perfect for hiking, cycling, playing and enjoying the outdoors without any hassle. Peplum: If you want to look casual, cute and also stylish at the same time, you need to pick a Peplum top. These ladies tops have a gathered flare strip attached from the waistline of the top. Peplum tops can enhance your body shape if paired well. You can pair them up with distressed denim, skinny jeans or a pencil skirt. From printed peplums to solid coloured peplum, you can pick the one that you think will enhance your looks. Crop Tops: Looking for something bold and impactful? Crop tops may do the trick for you. Shop for about ladies’ sleeveless tops later and flaunt your pretty belly and waistline, while creating a unique style in one of Zivame stylish crop tops. You will come across different types of crop tops that are sure to bring out the wild side of you. Wear it with a long flowing skirt, skinny jeans, denim pencil skirt, palazzo, harem pants, etc. You will find different styles for crop top online. Ponchos: Add some twist this winter with solid coloured ponchos. 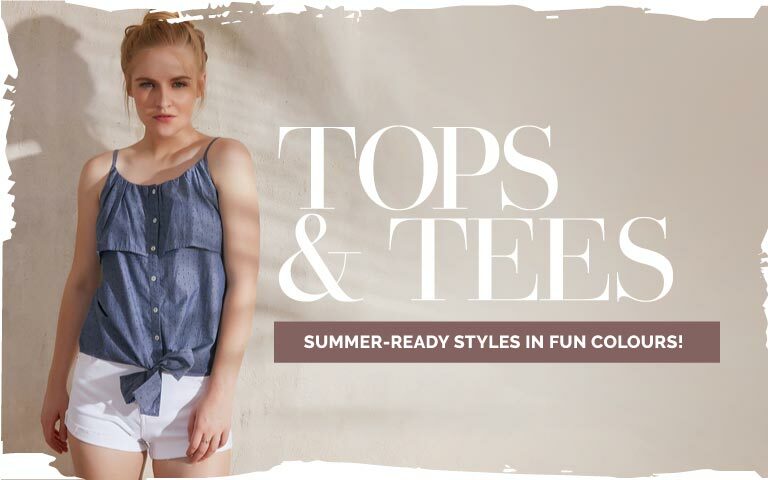 These casual tops for ladies are one thing that every fashionista should have. One of the majorly used fabrics for poncho tops is polyester. However, today you will come across assorted designs and fabrics. Wear them with your skinny jeans, jeggings or leggings and put on your dancing shoes. Off Shoulder: Want to flaunt those gorgeous collar bones? Grab yourself a stylish off shoulder top and let the world fall in love with the edges. These ladies tops are also referred to as Bardot, and they add a perfect tint of classiness. You can indulge in different off shoulder tops for a different occasion. For example, ditsy print for summer afternoons, bold coloured satin for special evenings or black lycra off shoulder top for movie nights. Pair them with short skirts, types of denim and jeggings for that perfect look. Zivame understands the need for fashion and comfort. We introduce different designs for different occasions and also offer the best price that one cannot deny. Be it a formal meeting, a casual outing with friends, a special evening with someone special or a day in pampering yourself, you will find assorted women’s top, both in our online and offline stores. Check out the wide range of women’s top collection by Zivame and style it as you want. From ladies’ floral tops to t-shirts for women, from geometric patterns to fabrics, you will definitely find the perfect ladies top that will make your day! Apart from beautiful ladies tops, you can also shop for dresses, slips, shrugs, boyshorts, bras and a lot more on Zivame.